anyone a half or full sibling to this 2 year old filly? At first glance, that filly looks just like Mucho Macho Man! Nope, this is the mare's first foal. She has a 2012 colt by Malibu Moon and a 2013 colt by Congrats. None that of which are well known. hmm cuz those two mares just sounded familiar to me. nice looking first foal for Coco Belle. Rags' colt by HenrytheNavigator is really pretty, and looks like he's got good bone and balance. Anodin, full bro to Goldikova, runs in the G3 Prix Paul de Moussac (1 mile) at Chantilly on Saturday 6/8. Born Gold is a great broodmare. Antonia Autumn- (3/4 to Gio Ponti) is entered for the 6th at Monmouth on 6/14. 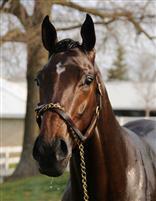 Deputy Striker (full to Curlin) is entered in the 5th at Hollywood on Sunday. It says on Equibase that she is scratched. Yay Mr Besilu drew in, he will make his debut today! Oh, thanks Rachel! He is looking so, so good. All those brothers are good looking horses! What does MTO mean i see it all the time on my Equibase app but can't seem to figure it out. Main Track Only, which mean she will only run if the race is taken off the turf. Animal Kingdom's baby half-bro, by Deep Impact. At Shadai Farm in Japan. Sure was nice to see Margano on the main track. He looked like he loved the dirt.